The Acorus genus, native to temperate and cold waters, is widely distributed outside its original breeding grounds. It will not tolerate temperatures over 22°C and is therefore exclusive to temperate aquariums. These plants reproduce by dividing a rhizome between the buds. 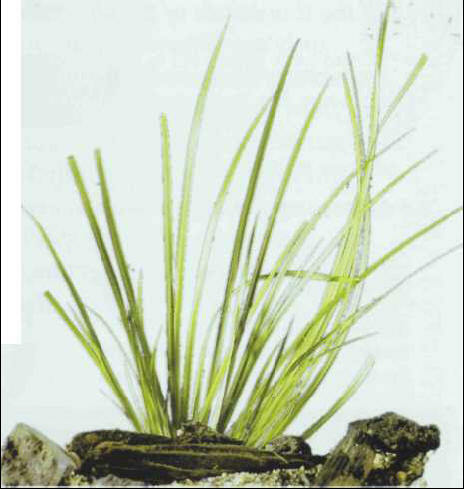 They are generally paludal (marsh plants) and are equally suited to aquaterrariums and garden ponds, although they will also survive totally submerged. There are two varieties of this species. The biggest, the green acorus, grows to a height of 30 cm; the smallest, the dwarf acorus, at around 10 cm, is ideal in foregrounds. The sweet flag or muskrat root is found in Europe. As it can grow to a height of over 1 m, it is reserved for garden ponds.